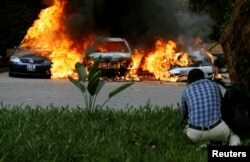 The Islamic extremist group al-Shabab is claiming responsibility for Tuesday's terrorist attack on a hotel and office complex in Nairobi, Kenya. Police say at least 15 people were killed and a still undetermined number wounded. The U.S. State Department has confirmed that one American was among the dead, but has not identified the victim. A British citizen was also reportedly killed in the attack. Kenya's Interior Minister Fred Matiang'i says the country is safe and the situation under control. But gunshots could still be heard several hours after he made that pronouncement. 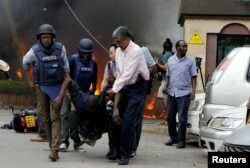 The attack on the DusitD2 complex began in mid-afternoon with an explosion outside a bank and a suicide bombing in the hotel lobby. Police found a sad and grisly scene inside one of the restaurants — wounded and dead diners at their tables, slumped over unfinished meals. Cars are seen on fire at the scene of explosions and gunshots in Nairobi, Kenya January 15, 2019. The militants targeted Kenya after Kenyan forces entered Somalia in 2011 with al-Shabab as their target. Tuesday's attack comes one day after a Nairobi court said three men accused aiding the Westgate attack will be put on trial. A State Department spokesperson tells VOA the U.S. embassy in Nairobi is closely watching the situation and "has actively offered assistance to local authorities."